Prototype: 4 different German State Railroad Company (DRG) express train passenger cars. 1 type AB4ü Bay 02 coach, 1st/2nd class, and 1 type Pw4ü Bay 06 baggage car. An appropriate add-on to the express train D 119 Munich – Cologne, around 1931. Model: The cars are highly detailed. Both cars have close couplers with guide mechanisms. The baggage car has 4 sliding doors that can be opened. Total length over the buffers 41.5 cm / 16-3/8. An authentic train composition for an historic express train. 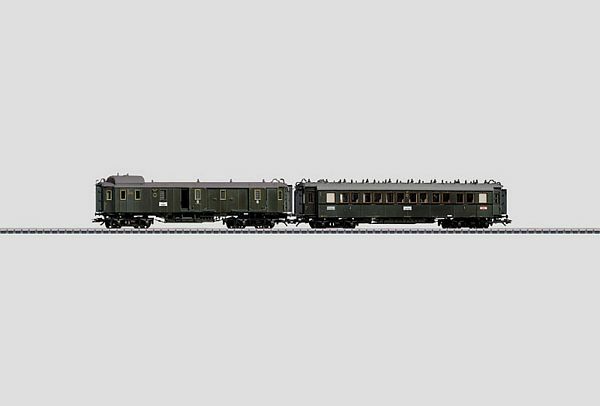 The 42763 express train passenger car set can be used to lengthen the express train D 119 (item nos. 37116 and 42762) in a prototypical manner. This express train can be further lengthened to a 9 car train with Trix item no. 23395, after changing the wheel sets.